Here’s some great info on how everything works for new users and existing RetouchUp clients! In this post we will discuss how to create an account and frequently asked questions about our Sign Up page. 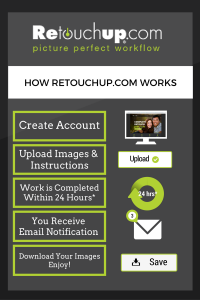 To get started at RetouchUp.com you will need to create a free account with us. Our system is not able to process orders that are sent via email. To set up your free account please click on the green Sign Up link in the upper right side of the screen. You will be asked to enter your email and create a username and password. You will need to also fill in your billing information. We accept all major credit cards as well as ECheck accounts in the United States. See the below FAQ for more info re: billing. A. No, there is no monthly fee or contract to sign to use RetouchUp.com. We only charge for orders that you have submitted. If you do not use us within a given month your card on file is not charged. Q. Why do I have to keep a credit card on file. A. We direct bill once a month, on the first business day of the month for the previous month’s balance. For billing convenience we require a credit card to be kept on file. This system allows you to review all orders and request any reworks if needed during the billing month before your card is charged. Q. I’m concerned with leaving my credit card on file for security reasons. A. We understand that our clients want to make sure that their personal information, especially financial information, is safe and secure when providing it online. RetouchUp.com has taken many steps to insure that your credit card information is protected by using Authorize.net and complying with outside security audits. Please click here for more detail on how your Payment Information is secure at Retouchup.com. Q. I live outside of the U.S. and the Sign Up Page is not recognizing my zip code. A. At this time our Sign Up Page only recognizes 5 digit zip codes but we are working to change that. You are welcome to enter in a 5 digit zip code (ours is 84004) and then after sign up you can edit your address to reflect your true one under “My Account” >> “Account Info”. Q. I have a URL for my photography business but it is not accepting the address. A. We recommend that you open a second tab or page open and copy your URL directly from your site and paste it in the URL field. If you are still experiencing difficulty please let us know! If you have any other questions about the Sign Up process please feel free to email us at customerservice@retouchup.com or call us at 888-700-3686. Thank you!